•If you had a dataset called rivers.shp and this was stored in a folder G:\Projects\ABC\vector then the workspace folder is G:\Projects\ABC\vector. •If your dataset was a personal or file geodatabase FeatureClass and was stored in Z:\Projects\XYZ\Data\myGeoDB.mdb then the workspace folder is Z:\Projects\XYZ\Data. •When you select the workspace folder RivEX uses this location to create a sub-folder called RivEX_Workspace. Topology, error logs and output are stored as sub-folders within this folder. You will also see a file called RivEX_Settings.xml. This is a simple XML file that holds all the information RivEX needs to establish links back to the dataset and any fields created. •You can delete the folder RivEX_Workspace without affecting your river network but be aware you will be deleting the RivEX_Settings file, cached topology information and any output created by RivEX (e.g. nodes or sampling points). If you have output generated by RivEX then consider copying it out of the directory using ArcCatalog before deleting the RivEX_Workspace folder. •The only folders you will need to visit are the ErrorLogs and Output folders. Do not remove any files from the TopoCache folder and don't change the RivEX_Settings.xml file! •The screen shot below describes an example. 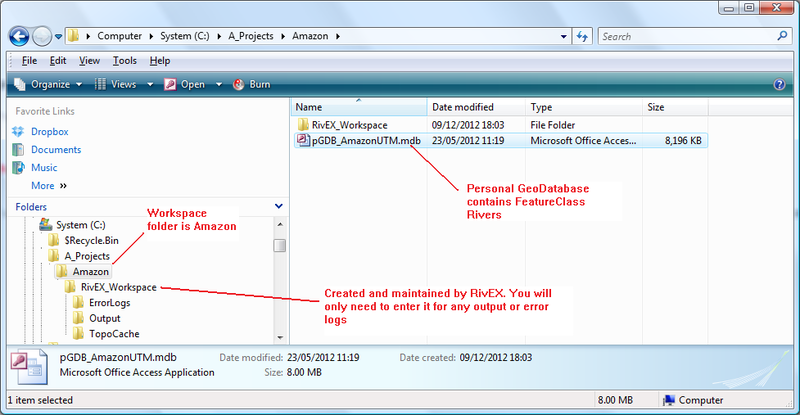 The user had a folder called Amazon and in it is a personal geodatabase which contains a river network. Thus the workspace will be C:\A_Projects\Amazon. It is RivEX that creates and maintains the sub-folder RivEX_Workspace. Each time the user wishes to process their river network with RivEX then they need to be selecting the folder C:\A_Projects\Amazon as the workspace. An example of a Workspace (C:\A_Projects\Amazon) with its RivEX_Workspace sub-folder. Do not make the mistake of selecting the folder RivEX_Workspace as the workspace folder! Its the folder above! You can only have 1 river network in a workspace folder. Having multiple networks in a single folder will cause RivEX to overwrite existing settings/topology data. Users of the previous version of RivEX will be familiar with the "hard wired" folder called C:\RivEX\Output. This folder does not exist any more it is part of the RivEX_Workspace.